30 will drop out the first year. Only rarely will one appear before a juvenile court judge. 12 will be from families that belong to no church, 6 of these will be brought into contact with a church and continue. 4 scouts will reach the rank of Eagle Scout. 45 will serve in the Military. 1 person will use scout skills to save another person's life. 2 will report that they used scout skills to save their own lives. 5 will receive church emblems. 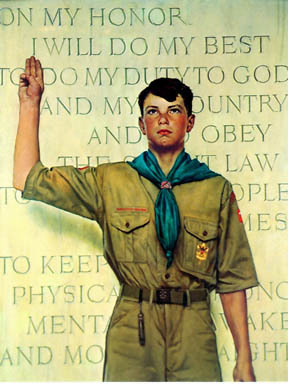 Only 4 out of 100 boys in the USA will become scouts but of the leaders of this nation in business, religion and politics, 3 out of 4 were scouts. Only 4 percent of our nation's youth were scouts, yet 65% of all college and university graduates were scouts. 26 of 29 of the first Astronauts in NASA's program were Eagle scouts and 133 of the 233 Astronauts were scouts at one time. Of Senior Class Presidents 89% were scouts. Of Junior Class Presidents 80% were scouts. Student Council Presidents 85% were scouts. School newspaper editors 88% were scouts. Football Captains 71% were scouts. Basketball captains 64% were scouts. So, 4 out of 100,make Eagle Scout. So what about the other 94 or 92 scouts who didn't make it to Eagle. Is it just wasted time? The scouts have "Aims and Methods". Things found in the Scout Oath and Law, the Patrol Method, Outdoors training, Personal growth, Leadership and So on. Advancement is certainly one of these, but only one. Just being part of the program gives the opportunity to "better and belong". Sure we know some famous Eagle Scouts like Sam Walton, James Lovell, Neil Armstrong, Hank Aaron, Gerald Ford, H. Ross Perot, Walter Cronkite, Mike Rowe, Michael F. Moore and Steven Speilberg. But how about some "Not-Quite-Eagles" like John F. Kennedy, Jimmy Buffet, Richard Dean Anderson, Harrison Ford, Merlin Olson, Richard Gere, Nolan Ryan, Jim Morrison, Jimmy Stewart, Joe Theisman, Bill Gates and not-quite British Scout's Queen's Scout - Paul McCartney. The list goes on and on. Not to late to get involved!